Building Frankenstein proved to be quite a project for the good Doctor. What with all the nuts and bolts, the finding of matching arms and legs, the bad toupee and not even talking about the size 54 shirt that was impossible to find in a decent pattern. It was enough to make any sane monster builder just give up and go and just cut holes in an old sheet and go with that. Well, if only Dr.Frankenstein could have had access to this quick Halloween DIY monster (well, ok - alien), then maybe he could have wrapped up early and actually made a few houses before they turned the lights out and pretended not to be home - seriously, we know you ran out of candy, quit with all the hiding stuff. Hat tip to my sister and her family for this original no-sew costume idea from years gone by. 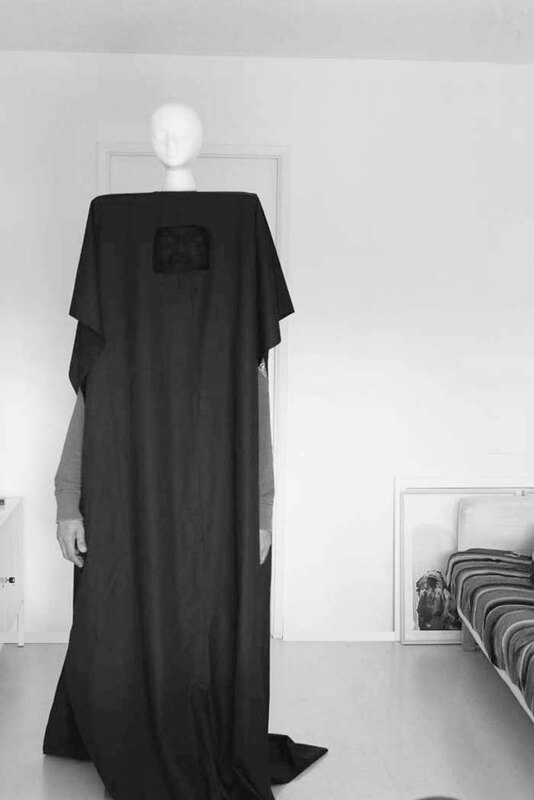 Still fresh in my mind, we thought we'd give it a go (with a few adaptations) for this year's costume—and it's just too scary not to share, yes? 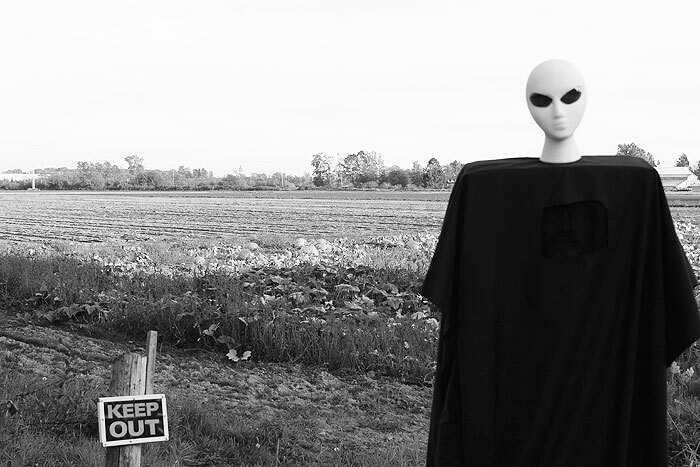 Happy Halloween soon! Prepare your box. The box will fit over your head. So it needs to have enough room for your head to fit, and also needs to be just long enough that it hits just above the shoulder. 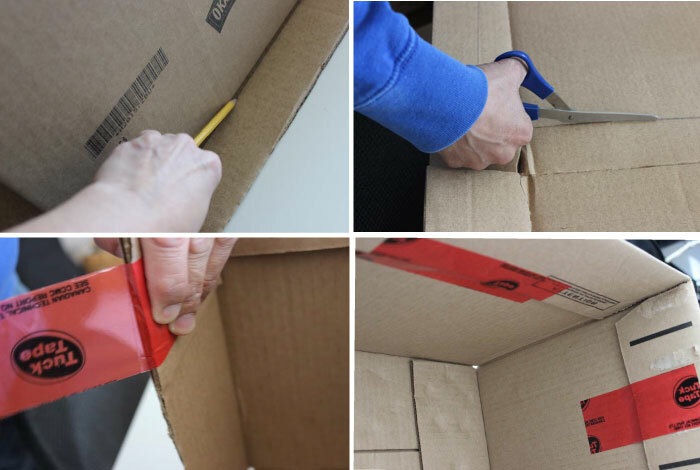 To secure the top of the box, we added an extra padding of cardboard to cover the crack where the two folds come together. Tape it shut with a good strong tape. We used Tuck Tape. 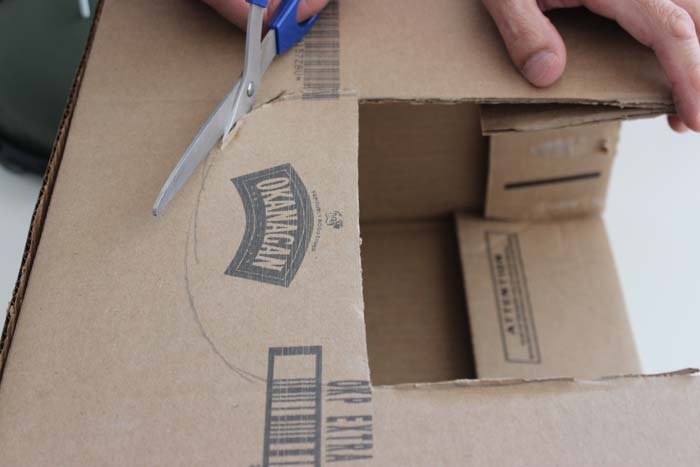 Cut out the front of the box so that your face will be able to see out. This is where the black meshing will go so you can see out through the broad cloth. Next you'll need to cut a hole into the helmet to fit a screw that will connect to the box and then onto the wig head eventually. Eyeball the screw to find the right drill bit. 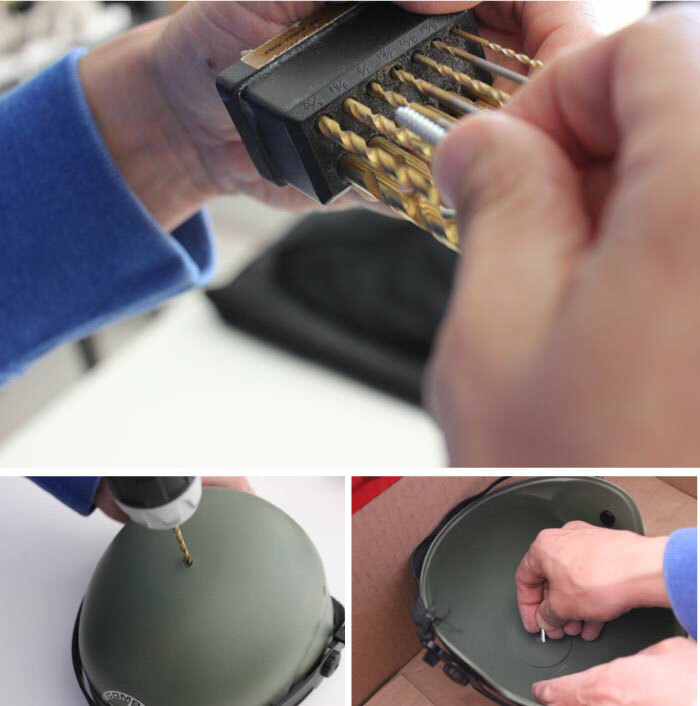 Once found, drill a hole into the helmet and then screw through to the top of the box. 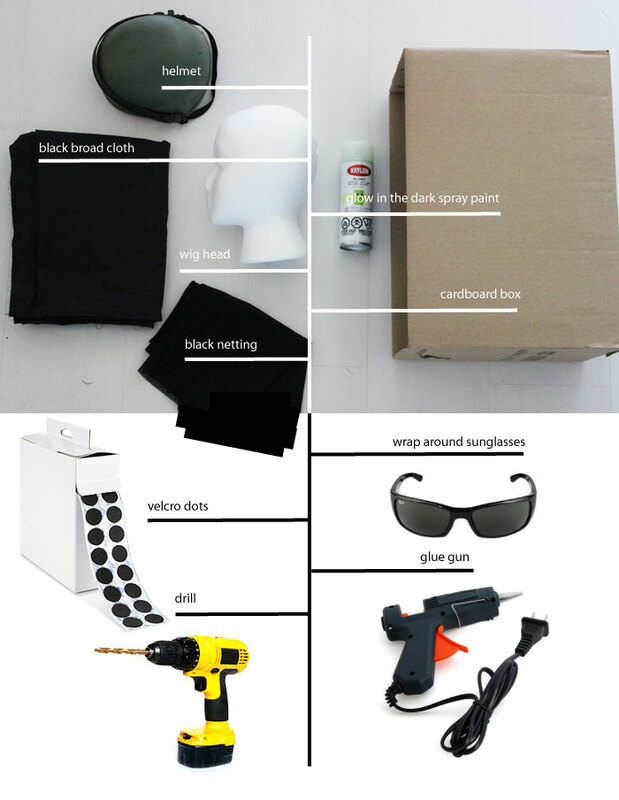 With the helmet in place in the box, place the box over the head of who will be wearing the costume, and pull the black broad cloth fabric over the box so that there's an even length on both front and back sides. Draw or trace the opening area of the box. This is where you will cut the fabric and replace with some mesh fabric, so that you will be able to see out when walking in the costume. Cut out the piece, place the mesh around and trip about a quarter inch border all the way around. 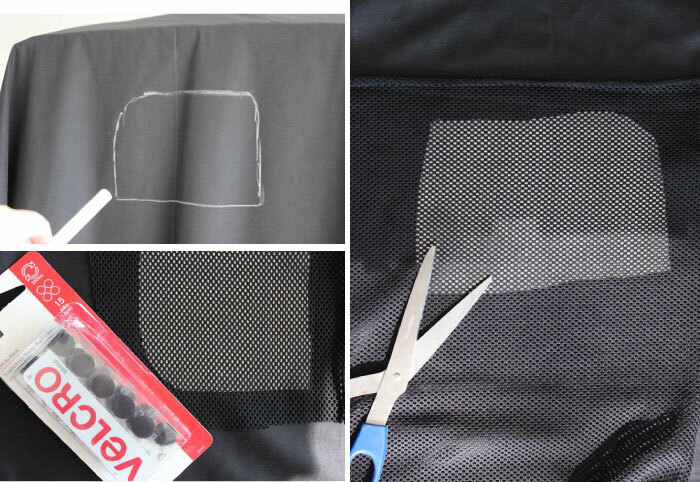 Using velcro dots you will be able to easily secure the mesh to the fabric. You could also sew it to the fabric if you're so inclined. Place the box with the covered mesh over the head of the wearer. 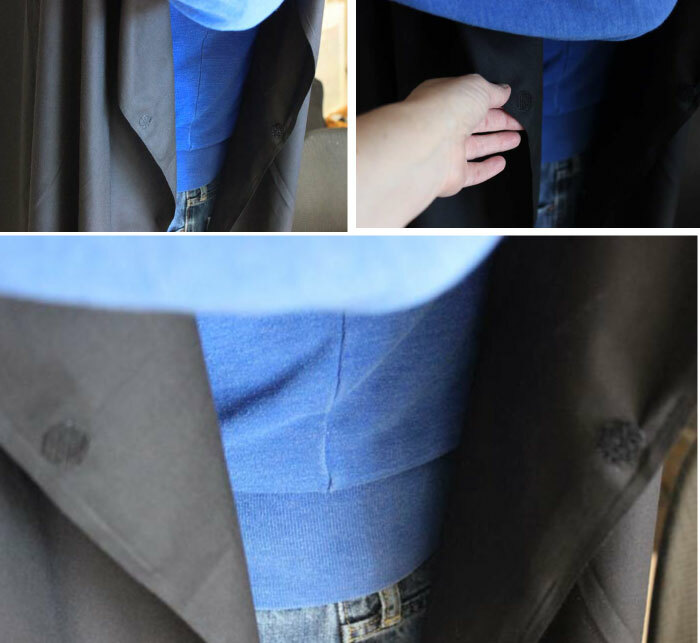 Secure two velcro dots on each side to cover the clothing area so that you won't see it. It's also recommended to wear all black underneath the costume to hide all clothing. 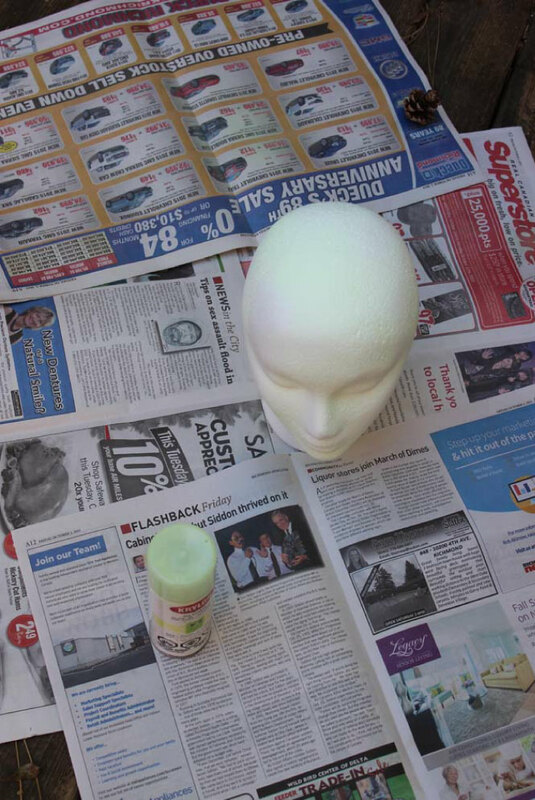 Spray paint the wig head and let dry. Note this is optional as the white wig head looks just as effective. Attach the eyes. 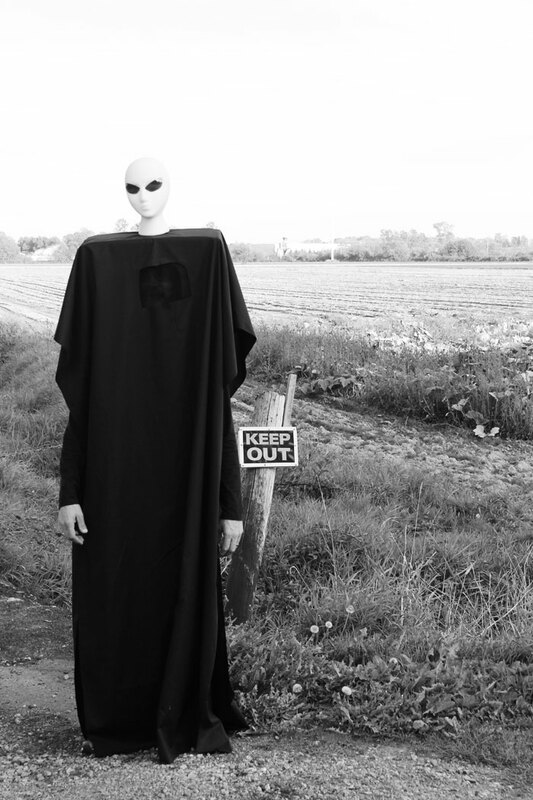 We punched out some wraparound sunglasses to make it look alien, but you could also draw these in. 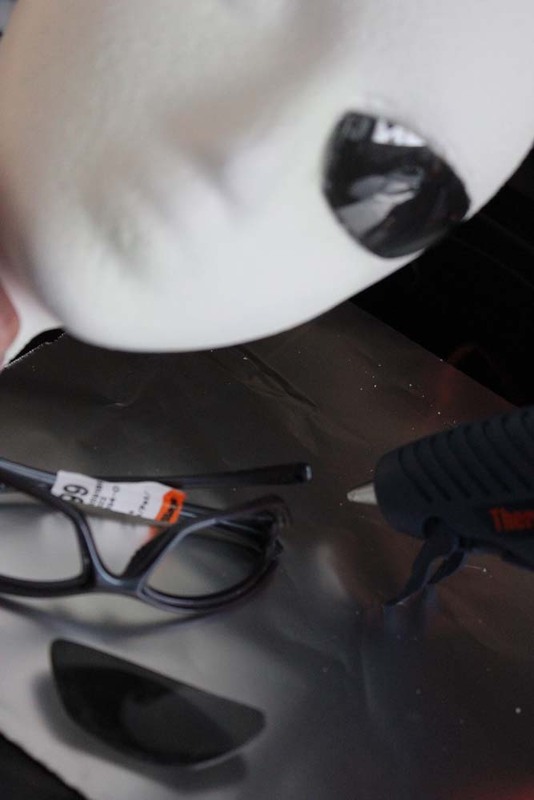 We attached the punched out sunglasses lens using a glue gun. Let dry.